After losing five runners from the previous year, 1972 season would be a rebuilding one. 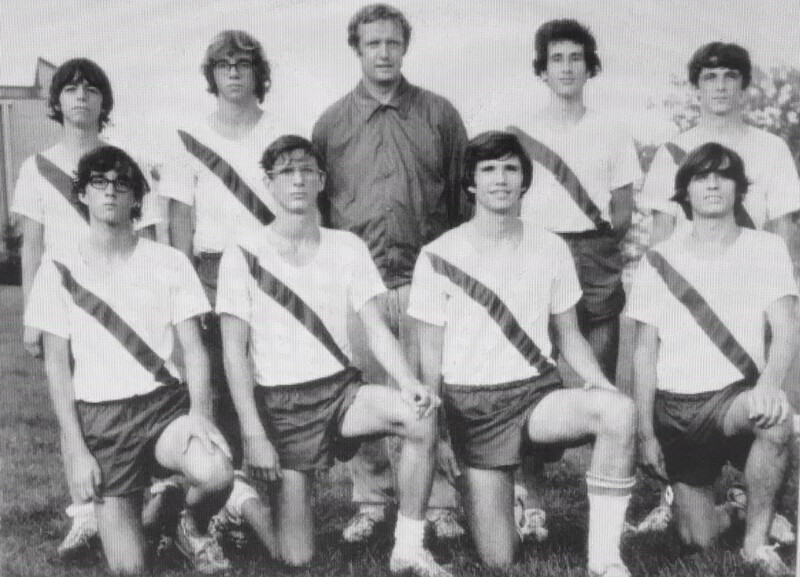 The team had only one senior, Dennis Fadely. 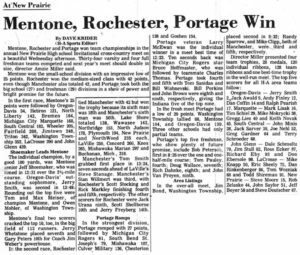 But the team had three returning juniors from 1971 (Larry McEwan, John Brown and Tom Sanidas) as well as three sophomores from the successful freshman team (Bill Wishnevski, Bill Perkins and John Longfellow). Senior Dennis Fadeley and junior Kevin Finnegan would round out the squad. The IHSAA also changed the distance for races this year from two miles to 2.5 miles. The number of runners a team could run in the state series (sectionals/regionals/state) would increase from six to seven. The team would post a very respectable 11-3 dual meet record and win the New Prairie (2nd year in a row) and Patriot Invitational (3rd year in a row). At New Prairie, Larry McEwan would finish first. However the team showed overall strength by placing 4 runners in the next 8 (5 in the top 9 for a low meet score of 27). The freshmen would also take the freshmen race. 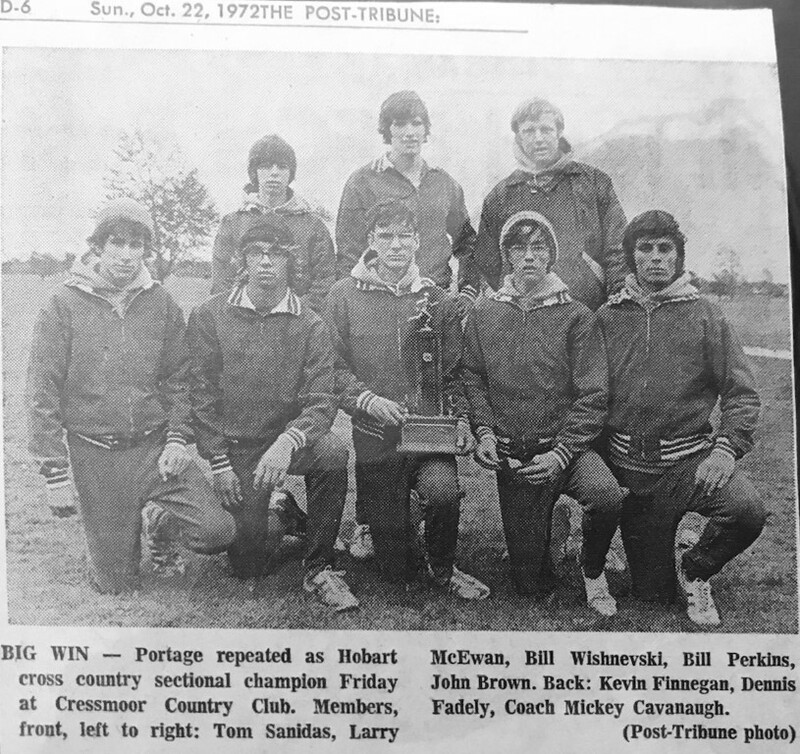 Portage was disappointed by a second place finish at the Duneland Conference meet to Hobart but would get revenge at the Hobart sectionals. 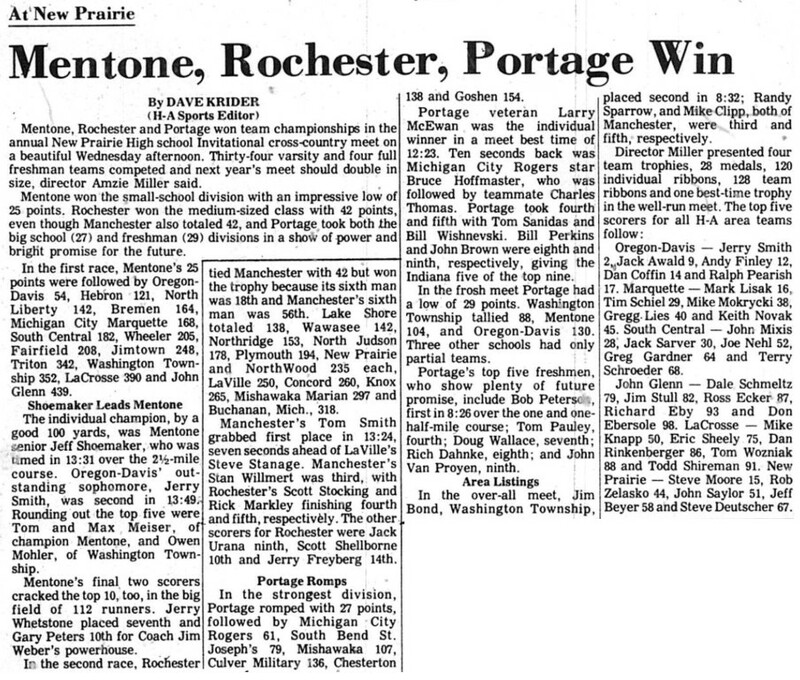 Portage would win their 2nd straight sectional, but not without a tie breaker. 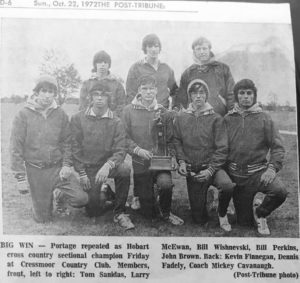 Portage tied Hobart (who beat the Indians in the Duneland) but PHS’ 6th man Dennis Fadeley beat the Hobart 6th runner to give the Indians the first place trophy. Hobart would win regionals, with PHS taking 3rd (behind Griffith as well). But PHS qualified for the state meet for the 2nd consecutive year where they would finish 6th, just missing out on a repeat trip to the truck. At the state meet, PHS would finish ahead of their regional competitors Hobart and Griffith. McEwan would finish 23rd and Sanidas 24th at the state meet to pace the PHS harriers in Indianapolis. McEwan would be named team MVP. McEwan, Sanidas and Wishnevski would be named All Duneland. Front L to R: Bill Perkins (So), Bill Wishnevski (So), Dennis Fadeley (Sr) and John Brown (Jr). In the spring the track team captured 1st place in the Duneland Conference meet, their 3rd in a row. Additionally, Coach Cavanaugh coached junior Russ Lindner to the state title in the discuss in the first year of competition for that event.